Durango’s own Ellen Campbell is off to a ripping start of the season for the Fort Lewis College cycling team. She took second in both endurance events last weekend in Granby and is even adding some gravity events to her schedule. The defending national champions are back on their home dirt. 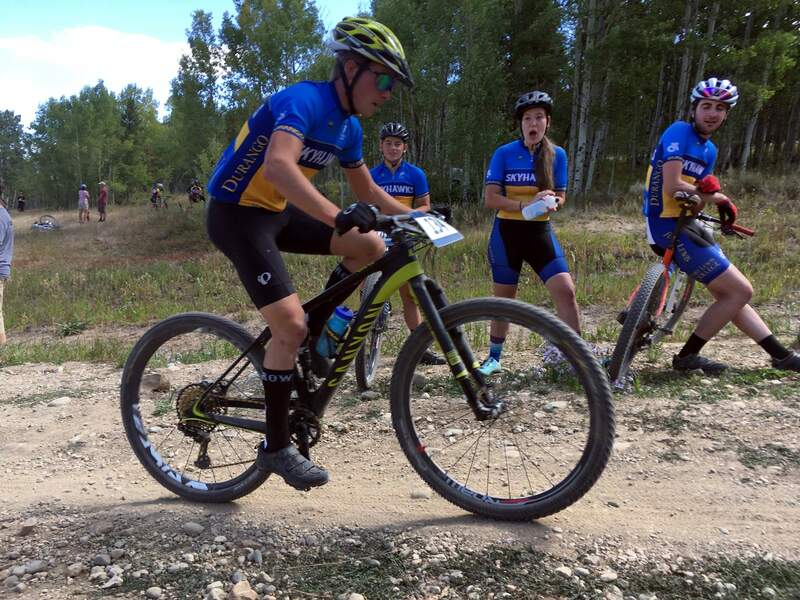 For the first time in seven years, the 23-time national champion Fort Lewis College cycling team will host mountain bike races this weekend at Purgatory Resort. Racing at the Squawker Mountain Bike Classic will begin at 8:30 a.m. Saturday and continue through Sunday afternoon. A total of 84 Skyhawks will compete among roughly 200 riders total. That’s a new record turnout for FLC, which brought 75 riders to a 2015 race at Angel Fire, New Mexico. The Skyhawks claimed their 23rd national title as a program at the 2017 USA Cycling Collegiate Mountain Bike National Championships last October in Missoula, Montana. This year’s championship race will return to the same course Oct. 19-21. Before the Skyhawks defend their crown, they will face a full season in the Rocky Mountain Collegiate Cycling Conference. Among this week’s teams attending Purgatory are conference foes such as University of Colorado, Colorado State University, Colorado Mesa University and Colorado School of Mines. 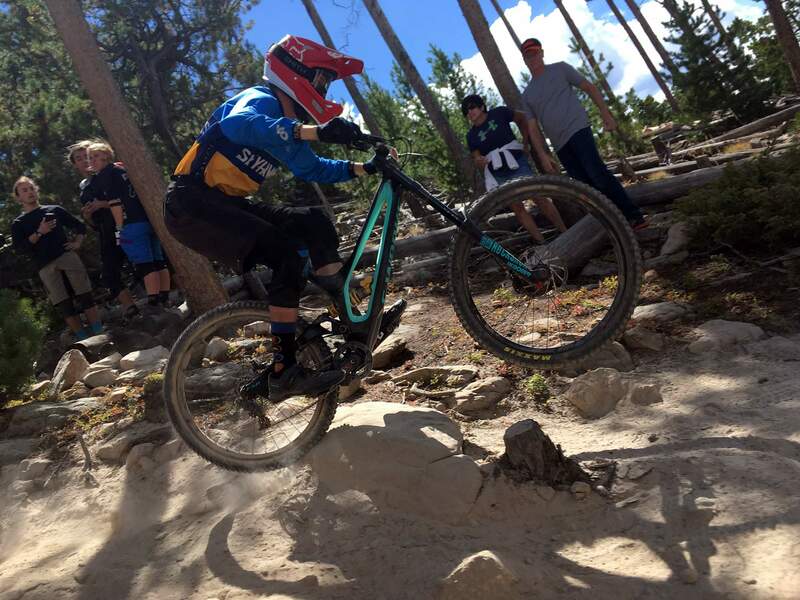 McCauley Smith is back for the Fort Lewis College cycling team a year after she won the downhill national championship. She won the downhill and super-D last week in Granby. 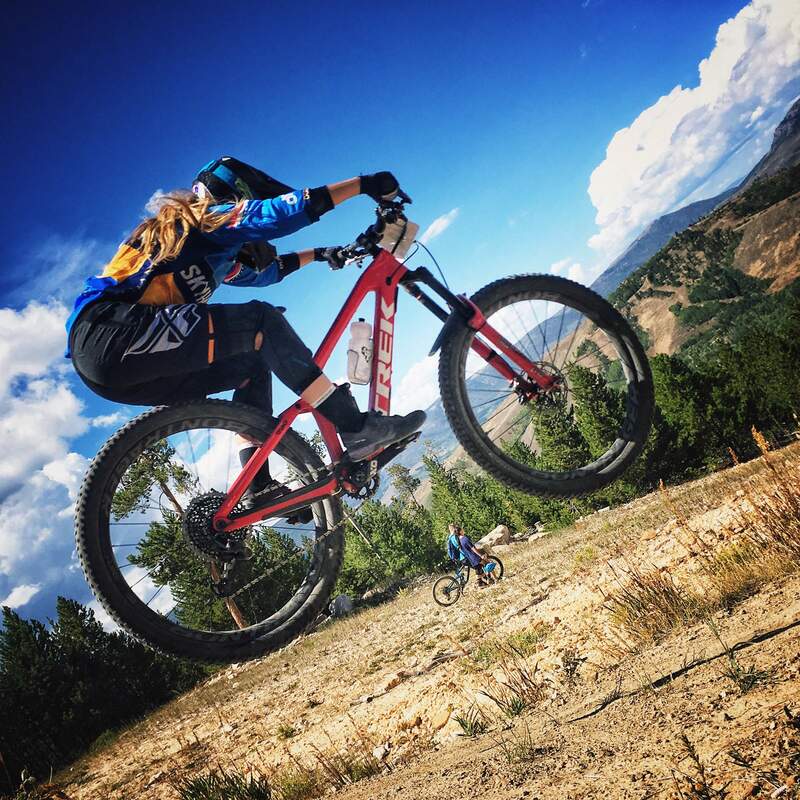 FLC will be without a few of its top mountain bikers. Savilia Blunk and Cole Paton are in Switzerland for next week’s International Cycling Union (UCI) Mountain Bike World Championships. Blunk and Paton were named by USA Cycling to the worlds roster for the women’s and men’s under-23 races. Campbell will be one of the top women’s riders to watch this weekend in the cross-country and short-track races, along with teammate Katja Freeburn, a sophomore from Durango who was fifth at last year’s short-track nationals. 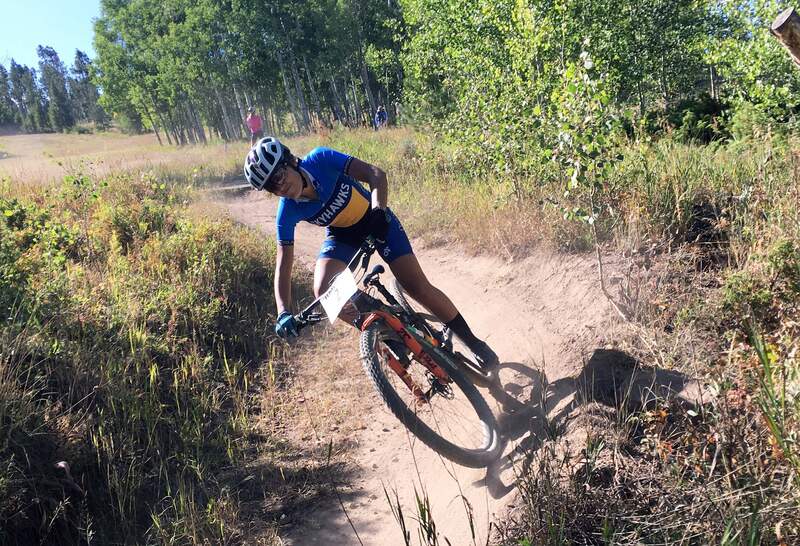 Sophomore Cooper Wiens, son of 1996 Olympic bronze medalist Susan Demateir and old-school mountain bike legend Dave Wiens, got off to a strong start in the RMCCC schedule, as he won the men’s short-track race last weekend. “He unexpectedly rode away from everyone with three laps to go and won by 30 seconds,” coach Chad Cheeney said. Wiens took second in the cross-country last week. He rode from the back of the pack and put in a strong final lap to catch the leader, Liam Earl, the defending national champ from Colorado Mesa. Wiens is joined on the A category men’s team by stars such as Jason Rowton, Thomas Gauthier and Durango’s Keiran Eagen. Cheeney is also excited about freshman Brandon Weir of Alabama, who is coached by three-time Olympian and FLC cycling alum Todd Wells. The team also boasts Sam Brown, son of Colorado mountain biking legend Charlie Brown. Durango’s Shane Ellis was the top gravity racer on the men’s team for Fort Lewis College last weekend in Granby. He had a pair of ninth-place finishes. Another top rider for the Skyhawks is McCauley Smith, the defending national champion in the women’s downhill. She won both the downhill and super-D last weekend. Smith is followed closely by Anna Shehrer and Durango’s own Lacey Anderson. On the men’s side of the gravity team, Shane Ellis of Durango was the team’s top rider last week with ninth-place finishes in both events. Asa McGill-Howe is another strong downhiller, and senior Jarron Lockwood has been with the team on three trips to nationals with multiple top-10 finishes. Ben Bennett is another name to watch in the dual slalom events, as he is a master of dirt jumping. Racing will start at 8:30 a.m. Saturday with men’s C category riders competing in short-track. The men’s A riders will begin at 10:05 a.m., followed by the A women at 10:40 a.m. The dual slalom event will begin with qualifying at 1:30 p.m., with the finals to follow. Fort Lewis College sophomore Cooper Wiens stunned the field when he rode to a 30-second victory in the short-track race last weekend in Granby. Sunday will get off to an exciting start with the A men’s cross-country race, along with the pro/open and Category 1 men, at 8 a.m. The A women will follow at 8:03 a.m. Downhill racing will conclude the weekend with an 11:30 a.m. start. “The XC course starts at the top of Chair 4 and uses most of the backside trails at the resort,” Hagen said. There are USA Cycling-sanctioned events for the public and juniors to compete in, making it a full weekend of cycling for locals. Online registration is available, and race-day registration also will be made available for an extra $5.